iiyama International, a leading monitor manufacturer and CI Games, the publisher of “Sniper 2: Ghost Warrior” computer game, join forces and launch a unique design competition with amazing prizes for the winners. The purpose of the “SNIPE YOUR MONITOR” competition is to give participants the opportunity to create an original and Sniper2 inspired monitor design, using a special application available at www.iiyamaplay.com. 1) 27" monitor ProLite B2776HDS airbrushed according to the winning design, Alienware PC, PC game Sniper 2: Ghost Warrior Delux Edition, iiyama and Sniper goody-bag. 2) 24" monitor ProLite B2480HS airbrushed according to the winning design, Nvidia graphics card, PC game Sniper 2: Ghost Warrior Delux Edition, iiyama and Sniper goody-bag. 3) 22" monitor ProLite B2280HS airbrushed according to the winning design, Nvidia graphics card, PC game Sniper 2: Ghost Warrior Delux Edition, iiyama and Sniper goody-bag. 4) 22" monitor ProLite B2280HS airbrushed according to the winning design, PC game Sniper 2: Ghost Warrior, iiyama and Sniper goody-bag. 5) 22" monitor ProLite B2280HS airbrushed according to the winning design, PC game Sniper 2: Ghost Warrior, iiyama and Sniper goody-bag. The design contest has already started and the first great designs have already been submitted. The official closing date is 30th of June 2013. The winner will be announced on 5th of August 2013. Join the contest and win yourself an iiyama Sniper2 inspired monitor of your own design! 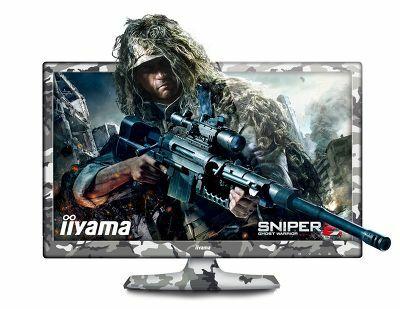 Furthermore, iiyama also announces a new promotion – buy iiyama ProLite E2473HS monitor from one of the authorized iiyama partners, register your purchase on www.iiyamaplay.com and get the Sniper 2: Ghost Warrior game (e-version) for free. The Promotion started on 15.03.2013 and will end on 31.05.2013. City Interactive is an international publisher, developer and distributor of interactive entertainment products with sales in more than 40 countries worldwide. It was established in 2002 and is listed on the Warsaw Stock Exchange since November 2007. City Interactive has development and publishing offices throughout the world including Poland, United States, Germany, UK, Canada and Romania. In June 2010, the biggest production in the history of City Interactive - "Sniper: Ghost Warrior", hit the shelves. The game proved to be a staggering success sales-wise, selling more than 3.000.000 copies worldwide. Currently, City Interactive has over 220 team members.